Last week’s premiere episode of The Franchise felt cluttered and frantic, unsure of where to focus with the pre-season and the first few months of the season to cover. With tonight’s episode, the directors were limited to a few distinct story lines, and it worked in the show’s favor. As baseball fans know, last week was the All-Star game, an event I personally consider a week off from baseball. And I think the players, at least professionally, seem to feel the same way. It’s clear the players enjoy seeing each other in a collegial atmosphere, goofing around at the home run derby, but they seemed less than amped-up in the locker room as Bruce Bochy delivered a pep talk that had all the zip and passion of a Lazy-Cake. 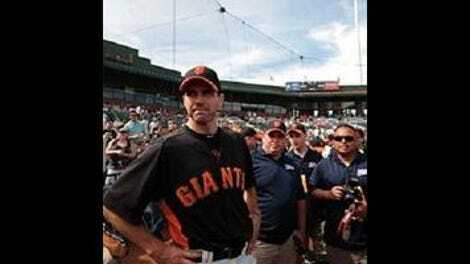 The All-Star game has always felt so phony to me, as players rotate in and out without any real investment in the game, and I was glad the directors showed Bochy’s confusion and frustration with the revolving-door roster. If I were a player, I’d definitely rather be Barry Zito, at home eating scrambled eggs and avocado. One player who had a great time playing in the All-Star game though was Pablo Sandoval, who enjoyed a 22-game hitting streak throughout the episode. Sandoval to me looks like a cuter, chubbier Sammy Sosa and the combination of that resemblance, his power hitting and the fact that he is a Giant makes me wonder if he’s on steroids. See, baseball? This is what you’ve done to me. I think Brian Wilson’s beard is probably on steroids too. Speaking of Wilson, I finally got what I wanted that I missed last week, and that’s more attention on Mr. Beardie. Both the narrator and Seth Meyers at the ESPYs ribbed Wilson for his spotlight-seeking ways and possible overexposure. I happen to find him pretty funny, and not because he wore a spandex tuxedo to the made-up awards show. I liked him twirling his mustache, saying with the points up that it’s “nonthreatening, inviting, fun.” I know obviously there’s the beard thing going on, but his deadpan manner reminds me of Zach Galifianakis. In stark contrast is Ryan Vogelsong, who comes off as painfully dorky, but it’s his dorkiness that makes me root for him. The series lets his wife, Nicole, do a lot of talking (I get the impression that she’s the talker in the relationship.) I find baseball wives to be interesting creatures, so I’m curious to know where she lies on the baseball wife spectrum, whether she fits in with the other gals or not. She seems pretty smart and her tale of her dying father rooting for Vogelsong was touching. Also, she’s a brunette, and there aren’t a lot of us out there in the spouse seats. So I think I like her. Next week, the second half of the season continues to roll on for the Giants as it does for the rest of baseball. This is an interesting show to cover as it’s impossible to say really what’s going to happen next week, both because it hasn’t all happened yet and also because I don’t follow the Giants. But I’m much happier with the show this week than I was with the season premiere, so I’m looking forward to next week’s episode. —Tim Lincecum looks like Wiley Wiggins in Dazed and Confused. —When the narrator said, “Things took a turn for the worse” and showed a shot of the San Francisco Bay, the cut made it look like Vogelsong got sent to Alcatraz.